In a person with normal hearing, sound enters the external ear and travels down the ear canal through the middle ear to the cochlea, or inner ear. This process is called air conduction. For individuals with certain types of hearing loss, sound is unable to travel down these pathways. 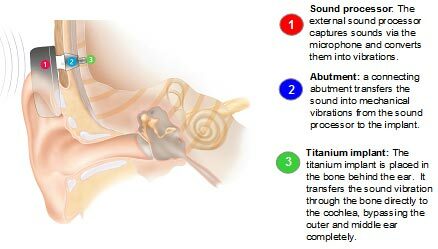 The BAHA system takes advantage of the bones’ natural conductive abilities by sending sound vibrations directly to the inner ear, bypassing the auditory canal and middle ear completely. Candidates for BAHA are typically patients with conductive and mixed hearing losses, or those with unilateral (single-sided) hearing loss in Singapore. Individuals who experience chronic ear infections that do not respond to treatment may find the BAHA system particularly beneficial. Conventional hearing aids can aggravate the condition due to humidity and moisture building up in the ear canals. Those with congenital ear defects (such as ear canals that are narrow or absent) are good candidates, as well. 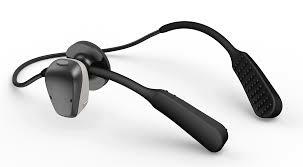 The audiologists at MyEar Singapore are experienced in fitting and programming BAHA devices. The BAHA device is made up of three components: a titanium implant, an external abutment, and a sound processor. Once the surgical implant is in place, it gradually fuses with the skull bone over a period of several months in a process known as osseointegration. The BAHA unit is then ready to be fit and programmed. The sound processor transmits vibrations through the external abutment to the implant, where vibrations in the skull and inner ear stimulate the nerve fibres responsible for hearing. The BAHA can even be trialled with a softband or headband, prior to implantation. The experienced clinicians at MyEar are passionate about finding the ideal solution for every one of our patients. Unilateral hearing loss can have a notably negative effect on those affected by the condition in Singapore and around the world. With treatments such as BAHA available through MyEar, you can look forward to getting the support you need with outstanding service.